-Only a few copies left!! Back in the 1950's, when television was black and white and the shows mostly dull, Walt Disney broke new ground with his "Disneyland" TV series. And one show electrified the nation: "Davy Crockett, King of the Wild Frontier." In three parts, Davy Crockett goes from an Indian Fighter, to become a member of Congress, to his final adventures at the Alamo where we last see him swinging away with his rifle atop those hallowed walls, surrounded by swarms of attacking Mexican infantry. The man who famously portrayed Davy Crockett, Fess Parker himself joins us for his take on the Davy Crockett fad, his experiences with Walt Disney, and of filming the trend-setting TV series! You'll hear his answer to the question, "Did we understand you to say they filmed a different ending than what we saw?" We're also featuring "A Time for Coonskins: Toys of Walt Disney's Dacy Crockett Craze" filled with a wealth of very cool 50's toys. 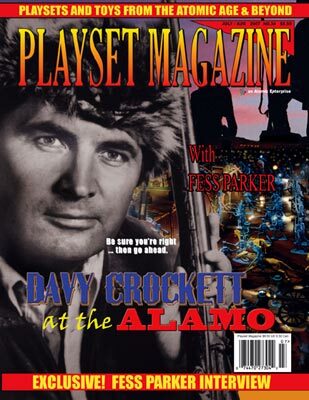 And of course, there's feature coverage on "Walt Disney's Davy Crockett at the Alamo: The Marx #3544 Playset" done PM style! We'll have full contents, variations on sets from small to large, and beautiful color centersperead photos. We're still working on this issue at this time, so look for fully-expanded feature coverage, news, toy show reports (The Texas Show, of course!) and much more in Issue 34 of Playset Magazine.